I received an advanced, uncorrected proof this book from an amazing publicist at Phenix & Phenix Literary. it would be amazing to live there. Two months later their, house is sold, their belongings are in storage and they are heading to Italy. They lease an apartment, find the kids a school, learn to speak Italian, make friends immediately and find out that sometimes less is more. Susan and her husband notice the changes in the children quickly. With no TV, radio, cell phones, computers and friends, the start looking for each other to talk, play cards and play together. Susan and her husband, spend their days, cooking, shopping, playing and riding a Vespa around Italy. Susan's new friend's show them that just being, singing with abandon, dancing, sharing a glass of wine and spending time together are what matters. She starts to look at what really matters, Tim, and her two children. She finds out that living the unexpected life in Italy was like "finding the fountain of youth." I highly recommend this book. Most marriages suffer after years. We feel unfulfilled, unloved, unmotivated, uninspired and we blame the person we are with. Susan took the opportunity to realize that she was blaming her husband Tim for this "lost part of her soul." We all feel lost at times; Husbands, wives, kids all of us. It isn't the fault of the person we are with, it is how we process what is around us or how we let our surroundings affect us. Susan says that at the end of our lives we will be asked to answer two questions. Did we live fully? Did I love well? Can we all answer this positively? Probably not. This is something we should all aspire to. I had to laugh over some of the arguments Susan and Tim have. He makes a joke, she tries to joke back but he takes it as a personal attack and vice versa. It is my relationship with my husband exactly. "Little moments that create canyons between us." Susan puts into words what most of us will never be able to do. Thank goodness Susan and Tim took this year off to re-evaluate and find their way back to each other. In the long run, family is what matters. At the end of this book, I had to ask myself, could my husband and I survive no television, no jobs, kids at school, no phone, no friends? I highly doubt it! In A Nutshell: You will not regret buying this book. It is a fantastic book and I am so honored to have had the opportunity to read it. Amazon is temporarily out of stock. However, you can order it and will be notified when it comes in. Your review sounds just as good as you said the book was. I will have to look for it at the library when it comes it. I enjoyed this review but I wonder why in the first sentence you mention the height of her husband. Was it a major part of the book or did it just amaze you he was so tall? I found that amusing. I so appreciate your review of Halfway to Each Other! You can also find me on Twitter and www.susanpohlman.com. 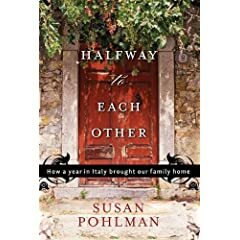 I got to read an advanced copy too and became an instant Susan Pohlman fan. "Halfway to Each Other" is funny, inspirational, and addictive. I'm buying every woman I know a copy!